Family Capital is an online publishing company dedicated to the global family enterprise sector. Our name is inspired by an idea. People often say that emotional, human or intellectual capital enhance a business, or a person’s abilities. We think that being a family is also an asset and we call this “family capital”. Family Capital has three missions. Firstly, it is a modern, online “house magazine” for family enterprises, providing a service for those working in the sector by looking at the issues and stories that touch on their careers and lives. Secondly, we believe there is a growing relationship between family enterprises (family offices and family businesses) and global capital markets. And Family Capital believes we are the only publication that covers this growing relationship. Thirdly, we will be an advocate for family ownership. We think family businesses’ long-term focus and attitude are good for financial stability, and yet the huge global influence of family firms is often overlooked by the mainstream press. We want to help people understand just how important business families are, both in the context of family offices and family businesses. If it doesn’t sound too grand, Family Capital aims to change the way its readers see the world of business. We think the best way to achieve these two aims is with a high-quality, straight-talking journalistic voice – something the sector currently lacks. While we support family enterprises we will not be mindless cheerleaders for them, and we will not shy away from criticizing them when we think it is justified. 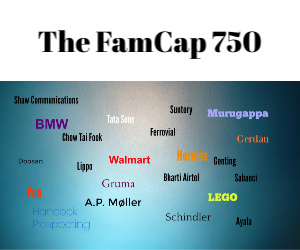 As well as daily updated analysis of the biggest family office and family business stories, and interviews with big names, watch out for our in-depth reports on aspects of the family enterprise sector, which you will be able to download from www.famcap.com. David has more than 20 years’ experience as a financial/business journalist, economist and entrepreneur, having worked for a number of prominent businesses including the Economist Group, Schroders, Dow Jones and Financial News. He has an intimate knowledge of family businesses, having edited CampdenFB and Campden FO, magazines for the global family enterprise community, and the EY Family Business Year Book. He also founded Wealth Bulletin, a website which he sold to Dow Jones. He is a graduate of London School of Economics and the School of Oriental & African Studies. Keith has overall responsibility as commissioning editor and also driving Family Capital’s real estate coverage.